Todaiji is a landmark in Nara, it is one of the most famous and historical temples which was built in 752 and now it is a UNESCO World Heritage Site. Todaiji is located near Nara Park and Kusagai Taisha Shrine so you also see a lot of deer wondering in this area as well. This is my second time to visit Todaiji temple, I was here many years ago when I was a student in Japan and I was here during the school excursion with my Japanese teacher. My guessing was horn but the answer was not correct. The two gold thingy at the top of the rooftop represents fish, not horns. Reason being the building was destroyed by fire multiple time so building that has a pair of fishtail symbolize water to protect against fire. There is free guides service at the entrance of Todaiji temple so I asked for one. She is a retiree who speaks English and offers free guide service. If you are interested to learn more about Todaiji, please look for one at the entrance and it is free. The guide will explain the architecture, history but she will not go inside the temple with you. Todaiji is a Buddhist temple, not a Shinto shrine so you will not find any “Torii” or the Japanese red gate at the entrance. Todaiji Temple is a complex of buildings that has the world’s largest wooden structure which can house a huge bronze Daibutsu (Great Buddha) inside the temple. The “Daibustu” or Great Buddha is in the lotus sitting position. The Daibutsu is made of copper and bronze, his intricate hairstyle is made of 966 bronze balls. Emperor Shomu (724-749 AD) is the one who asked to build this huge temple complex, his motives are a mix of the spiritual and the pragmatic. He wished to unite various Japanese clans and at the same time promoting spiritual unity. So Todaiji became the chief temple and national rituals were performed here. This is an expensive building built to impress and show power and the emperor made his people pay a high tax to pay for this stunning architecture. People were actually suffered from the construction of the Todaiji Temple. A statue of the bodhisattva Kokuzo Bosatsu (above) in gold color is also seen near the Daibutsu, this is a deity of wisdom and memory. 6. Bronze Octagonal Lantern – Treasure! There is a stand-alone bronze octagonal lantern located at the center of the wide pathway between the Daibutsuden and Chumon Gate. This is one of the treasures that remains until today. Many of the treasures coming from India and China were destroyed by the earthquakes but this bronze octagonal lantern is one of the surviving items. You see a huge pillar with a hole at the bottom and there is a line to squeeze through this healing pillar. Most of them are young children. 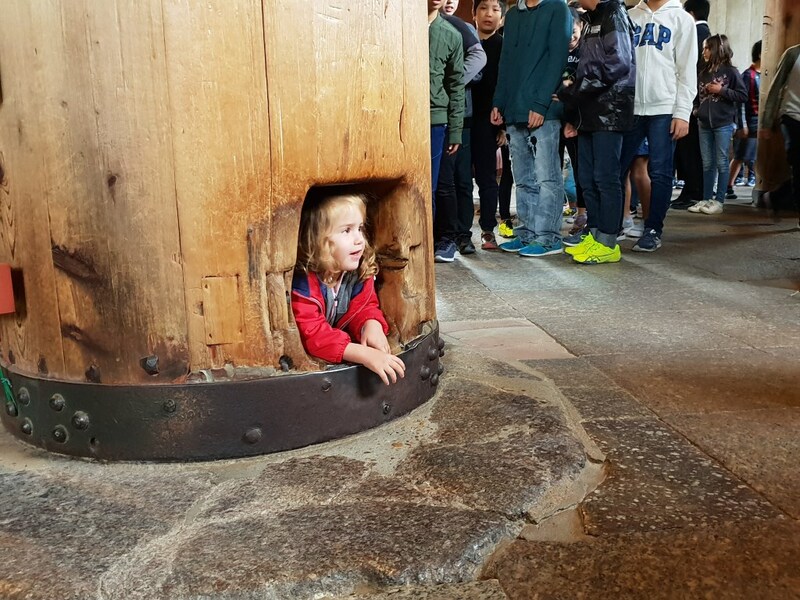 It is believed that if you are successful in squeezing through this hole, you will be granted a place in heaven and plenty of luck. Don’t be alarmed by the look of this sculpture, it is called Binzuru, seated in the lotus position and usually wearing red bibs and children’s cap. It can be seen in Todaji too, but the Binzuru here is bigger than the other one I saw in Japan. According to belief, if you rub the part of the sculpture that corresponds to the part of the body that is ailing, it will be cured. Chozuya is the hand washing station at the temple. One should clean their left hand, right hand, mouth and finally the handle of the water ladle to purify themselves before approaching the main temple. It is usually seen in Shinto shrines but in Japan, you can also see “chozuya” washing station in the Buddhist temple. If you are visiting Japan, students in the yellow hat can be seen everywhere and some in the red hat. Primary 1 usually wear a yellow cap as it is more outstanding and people pay more attention to them especially when crossing the road etc. This is the National treasure of Todaiji and please do not miss this important gate. The original gate was destroyed by a typhoon during the Heian period and the current structure was built during the Kamakura period and based on Song Dynasty Chinese models. There are two giant guardians standing at the side of Nandaimon, both are built from cypress wood and stand over 8 m tall. Do look out for these pair of treasures when you are crossing the Nandaimon Gate. There are several restaurants in Nara Park or near Todaiji Temple so we just randomly choose one and go in. The sweet tofu skin is called “kitsune” and udon is one of the comfort food in Japan. Cheap and found everywhere. Deep fried chicken with special marinated sauce with raw cabbage and some “tsukemono” (in pink) – pickles. Children and students love this set. Glad to have a free English speaking guide to explain the history and architecture of Todaiji temple. The number one thing you may want to try is to squeeze through this healing pillar to get a place in heaven and also good luck. And don’t forget to play with the roaming deer, feed them and hug them! What do you like most about Todaiji temple? And why? How interesting! I would love to check this out one day. Thanks for sharing this with us. The deer would be one of my favorite in Todaiji Temple complex. There are plenty of things to do and you can spend a whole day in this area. You may want to include Nara Park and Kusaga Taisha, another Unesco World Heritage Site. Such a wonderful place to take a wonderful trip . It’s so really nice ambiance to spend with family and loved ones. The architecture of Todaiji is really standing and grand. This Buddhist temple is also the head of temple in Japan for Buddhism. Plenty of history to learn about. Such a beautiful place in Nara to visit. Your photos are gorgeous. Thank you for sharing. I would love to visit Japan someday. The food looks delicious too!!! Japanese cuisine is fun to explore if you happen to visit Japan. In fact, Japan overtook France to become the country with the most 3-starred Michelin restaurants in 2011. The foods that I have near Todaiji Temple Nara are nothing too fancy but just the everyday meals that the Japanese eat. And I never get tired of Udon noodles, it is one of my comfort food and it cheap. Wow, I have never been to a place like this. The temple is very beautiful and maybe one day I will get to see it. This looks like a cool place to see. I would love to try the food there as it sounds so delicious. There are many interesting foods to explore in Nara but the one I have are just the everyday food Japanese eat, not particularly from Nara city but can be found all over Japan. The top food that you may want to try in Nara are “Kakinoha-zushi”, a type of sushi that’s nature to Nara and was invented around the Edo period (1603 – 1868). The fish used was preserved fish and not fresh and wrapped in persimmon leaves. Those all look like such neat places to visit. That space in the pillar looks pretty small to squeeze through – I wonder how often tourists get stuck! Lots of unique destinations to explore! I looooove historical sites like this! so interesting! Looks like you had a great time in this nice location. I wish to be there someday. It’s nice to visit historical sites. Culture is very much alive there. You must have been having a great time learning the history of the place. Yes it’s very convenient to have a guide that can soeak English so they can tell you about the history of that place. I love Japanese food too! The good thing is the English speaking guide is free of charge and they are seated at a corner at the entrance of Todaiji temple. What a beautiful place to visit! I definitely love going to new places with plenty of information beforehand. What a gorgeous place. I would love to go there one day. Now I’ll know everything I need to know. Wow I’ve never heard of this temple! So cool that it is a UNESCO World Heritage Site. Would love to see it with my own eyes. This looks like a beautiful place to visit. I love that you give so much information so that you can arrive prepared, and ensure you understand what you are viewing. I hope my guide will help visitors to learn some background and know what to look out for when going to Todaiji Temple and not missing out anything. This is totally the complete guide. The places are absolutely wonderful. Food looks worth trying as well. Japan is my dream place. Going to many of the temples are on my bucketlist and now I will add Nara Todaiji is on it because of you. This is so interesting. Can’t wait to visit Japan! It is so amazing at Nara Todaiji! All that treasure intrigues me…I hope I also get to have a look at that largest wooden structure that still stands! Japan is indeed fascinating! The temple looks so serene. I would love to go here one day.